A very general statement is : South Indians are fond of rice ~ North Indians – of wheat (atta). 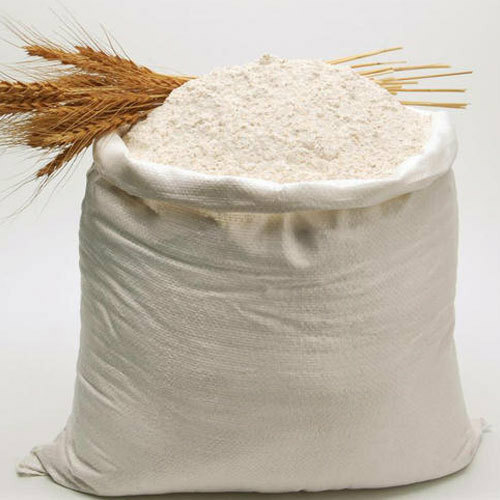 Atta is wheat flour, used to make food items like chapathi, roti, puri .. then there is ‘maida’ finely milled flour without bran, refined and used to make naan, paratha, bread and other food items. In making atta, whole grains are ground to convert it into flour – this flour is further refined to separate the husk and the bran to leave behind a very fine flour, maida. While atta would be brown, maida is white - the endosperm part of the wheat grain. Maida is also chemically bleached to leave it super white and very smooth. I need to stop trying to describe something which is not my domain .. .. .. Sadly, there are fire accidents – arising out of various causes, most commonly electrical short-circuit. What be the cause, a fire accident can reduce a property to rubbles in hours ~ it can cause damage to property, goods and sometimes- fatalities and bodily injuries to humans too. A Fire Insurance Policy provides financial compensation for loss or damage arising out of fire. Negligence and indifference too contribute a big way and there are potential physical hazards of fire. While elimination of fire hazard entirely may not be possible, fire safety would reduce to a large extent, the potential hazard of loss caused by fire. Fire safety measures include those that are intended to prevent ignition of an uncontrolled fire, and those that are used to limit the development and effects of a fire after it starts. Insurers analyse and rate the risks based on risk potential, probability of occurrence, severity of damage and many other factors. The method of rating special hazards is more complex. For better managed risks, they do offer discounts and one of the primary questions in any proposal is about the – fire fighting equipments available and the proximity to a Fire station. 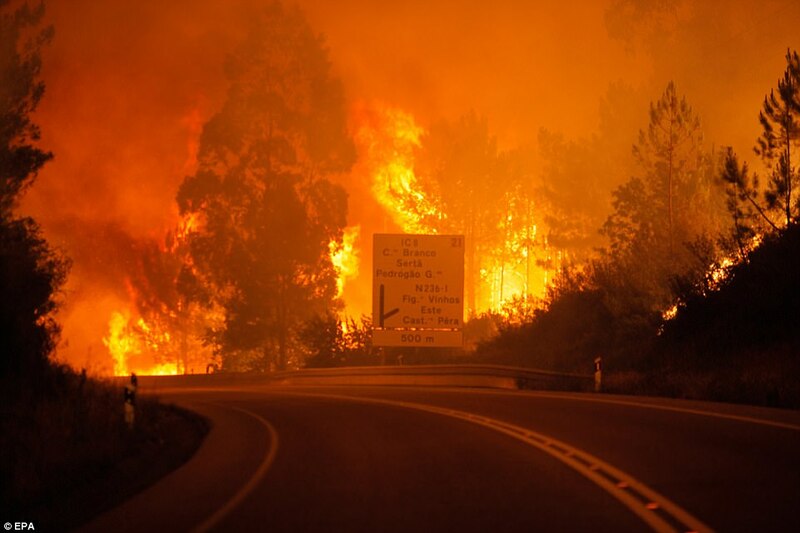 Class A fires : ordinary materials like burning paper, lumber, cardboard, plastics etc. Class B fires : involve flammable or combustible liquids such as gasoline, kerosene, and common organic solvents used in the laboratory. Class C fires : involve energized electrical equipment, such as appliances, switches, panel boxes, power tools, hot plates and stirrers. Water can be a dangerous extinguishing medium for class C fires because of the risk of electrical shock unless a specialized water mist extinguisher is used. Class D fires : involve combustible metals, such as magnesium, titanium, potassium and sodium as well as pyrophoric organometallic reagents such as alkyllithiums, Grignards and diethylzinc. These materials burn at high temperatures and will react violently with water, air, and/or other chemicals. Handle with care!! Class K fires : are kitchen fires. This class was added to the NFPA portable extinguishers Standard 10 in 1998. A fire extinguisher, is an active fire protection device used to extinguish or control small fires, often in emergency situations. As we all know, Fire needs “oxygen, heat and fuel” and primarily fire extinguishers put out fire by taking away one or more elements of the fire triangle. As stated above, there are various types of fire – say of wood, cloth, plastics; oil, gas, flammable liquids; electrical and the like. Depending on the type of fire, the extinguishers also vary – there are : water and foam fire extinguishers; equipments using Carbon Dioxide; dry chemicals; wet chemicals; dry powders and many other agents. In some industries, hydrant systems are installed, but more simpler are hand appliances. As a measure of safety, the primary requirement would be at least two extinguishers in every area/ room, distributed over the entire floor that they are available within 15 meters. One 9 litre water / sand bucket is to be provided for every 100 square meter of floor area and one 9 litre water type extinguisher is to be provided for every six buckets or part thereof with a minimum of one extinguisher and two buckets per compartment of the building. 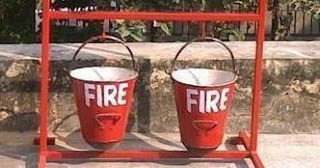 In old theatres, one would have observed bright red coloured buckets containing sand and water. . a fire bucket is a bucket filled with water or sand which is used to prevent or extinguish fires. Often they have a convex, protruding bottom. The rounded bottom results in a strong, directed stream of water when the material inside is thrown at the fire. Fire buckets are a low-technology method of fighting small fires. Although largely superseded by more modern forms of firefighting equipment, they retain some distinct advantages and remain the preferred method for fighting small fires in certain situations. The main advantages of fire buckets are that they are cheap, reliable, easy to use and can be quickly refilled and reinstated. The fundamental thing is to keep them in reach – and more importantly keep them filled with sand (or water) – with 4 of them hanging in a row, one should remain empty and at a given periodicity, the sand from should be transferred to the next – to ensure that sand is free flowing and is not clogged ! When the sand in the bucket is dumped on the fire to starve it of the oxygen it needs to stay alight. The sand from a fire bucket can also be used to absorb spills of flammable liquids and render them less dangerous, by reducing the risk of ignition and explosion. Fire buckets are often provided at petrol filling stations to absorb any small fuel spills. Now read this interesting type of fire extinguisher ! Following a major fire at a restaurant in Kamala Mills last December, Mumbai’s hotels have been under pressure from municipal authorities to get their act together with regard to fire safety norms. The Hindu reports that the Indian Hotels and Restaurants Association (AHAR) requested that it be allowed to use ‘roti atta’ (flour) instead of sand to tackle the initial stages of a kitchen fire. “Using flour to fight a fire is the stupidest idea I’ve ever heard,” said a professor from IIT-Bombay. “Flour becomes a combustible gas.” However, Sunil Keswani, a plastic surgeon and medical director of the National Burns Center in Airoli, said flour might be a good substitute for sand for curbing kitchen fires induced by oil.